Danny Cheng: "Is that new Headphones by Monster Beats in the video too? So nice~~"
Engadget: "Whoulda thunk that the third time we'd see the BlackBerry PlayBook on video, it'd be in the hands of cube-headed dopplegangster Will.I.Shill? 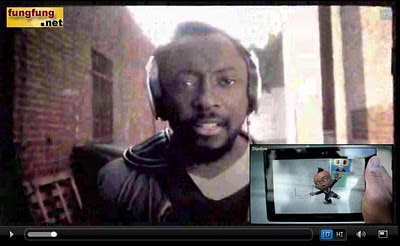 Not us, but we're terribly excited to see the 7-inch tablet show off its augmented reality chops in the Black Eyed Peas' latest music video. We're not really sure what alternate reality hijinks turned the musicians into 8-bit portraits nor pixelated their world, but the BEP sure look adorable as Xbox LIVE-friendly avatars. Watch it after the break, or skip to 2:12, 3:16 and 3:54 if you just want to get your tablet on." Danny Cheng: "Angry Birds and Evil Pig look like the current situation of North and South﻿ Korea~"
mashable: "Have you ever wondered why the angry birds and evil pigs from Angry Birds can’t put aside their differences? A new YouTube video helps explain why. 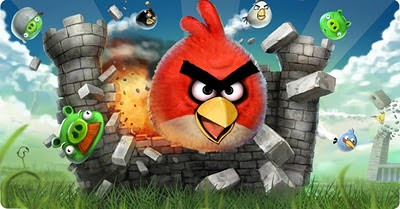 Angry Birds have taken the world by storm. It is the iPhone’s most popular game (no longer the top-grossing one) and hugely popular on Android. For those of you who haven’t played yet, the story focuses around the angry birds trying to reclaim their eggs from the evil pigs. In this short, two-and-a-half minute video (which is going viral as we speak), the angry birds finally sit down at the negotiating table with the evil pigs to end the struggle, “which has cost millions of innocent people their ability to concentrate in work.” However, things go wrong and not even the negotiator or the Angry Birds (Angry Birds) theme music can keep both sides from engaging in all-out war. The video was created by Erez Nehederet (Hebrew for “Wonderful Country”), a popular live sketch comedy show in Israel, as part of a promotional campaign for its upcoming season. Originally the video was created in Hebrew, but after a lot of U.S. interest, the video’s creators created the English version that you see here." Danny Cheng: "love the Titanium, carbon fiber and likes the Hybrid drive “pedelec” system"
Yanko Design: "This is a fast bike. It’s called “The Beast” and it’s designed and executed by M55 Bikes and it goes 40 miles per hour. 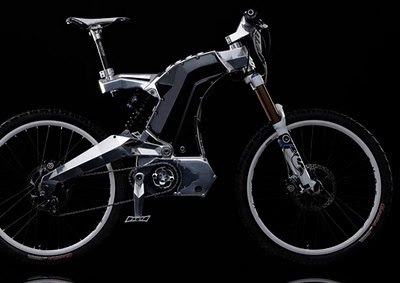 One charge on this electric bike and you’ll go as far as 75 miles even off-road. That’s impressive, yes? It’s made of custom parts created by M55’s seasoned engineers, using technology and materials used in Formula One cars and supersportscars alike. Titanium, carbon fiber, CNC machining, and a brushless motor mechanism, plus more! Each of the non-custom parts on this magical machine are of the finest quality, chosen by the M55 crew to meet golden standards. It’s got a hybrid drive, making it an addition to your high-falootin human powers. Each time the sensor feels you need some extra torque, it packs a punch and blasts you forward, multiplying your power like one of those Japanese exosuits from the comic books. Such a monster. Motor: EB-PC motor with 5.2 Nm torque"